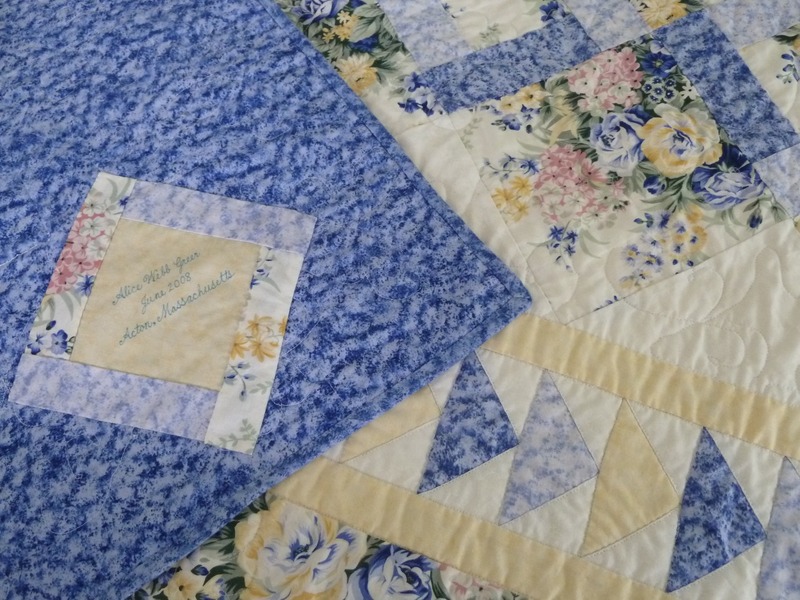 I pulled this one out of the closet for the Blogger's Quilt Festival. It's based on the Garden Twist pattern with a few twists of my own thrown in. I love the interplay of the dark and light blues but I thought it needed some yellow to add more contrast. This is one of the few quilts I've made that actually lives on a bed. Someday I'll get around to making matching pillowcases. This quilt is entirely hand pieced. Yes, all those flying geese, the borders, all of it. I pieced the entire center section in a week. We were on vacation in Maine and it rained the whole time. The flying geese took a lot longer! This is the quilt that convinced me it was time to make friends with my sewing machine. 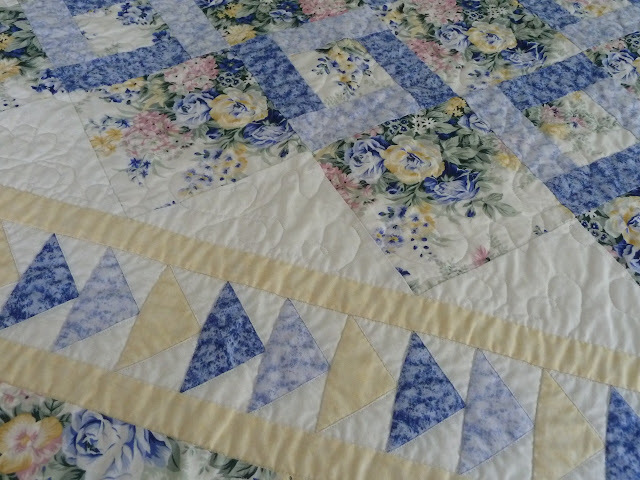 This is the first quilt I quilted on the longarm. I used a butterfly panto for the center and outer borders but did stitch in the ditch around all those geese. It took me two full days! I'm not sure when I started this but according to the label I finished it June 2008. So good of me to label my quilt: ) Be sure to grab a cup of tea, kick back and enjoy all the other fabulous quilts and thanks to Amy for organizing! Hand pieced!! Wow :D Such pretty fabric, too. Wow! Nice job! Love it lots and it's one of yours I hadn't seen. The colours are lovely--they feel really soft and gentle. 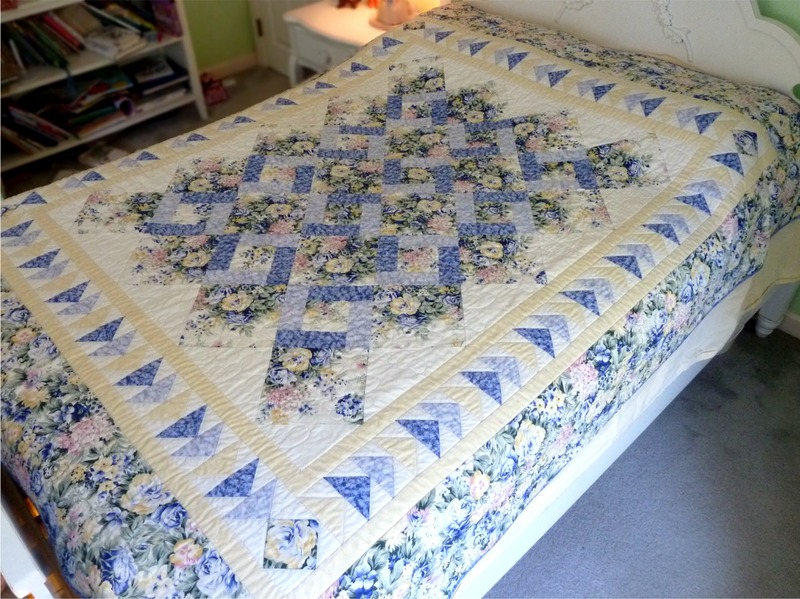 I hand piece a great deal but I'm seriously impressed that you hand pieced a bed sized quilt! Your quilting is lovely too! Very lovely quilt - and all handsewn?? Phew. Makes me tired to think of it! Excellent work! Beautiful quilt! Oh, lordy, all that hand stitching! I would have made friends with the sewing machine before all the hand sewing! LOL You did a fabulous job and must be so proud to have sewn this all by hand...no easy feat! I love your blog, but as before I cannot figure out how to follow it! Pinterest isn't your blog but I looked there also. PS thanks for the look at the up coming Ghastlies!! Forget about the following--- I wasn't signed in so there wasn't a place to click! Silly ol' me! So now I am a follower for real! Hand pieced and machine quilted, now that is different! It's beautiful, the colors remind me of a china pattern. Lovely!